Heat oven to 350°F. Grease bottom only of 8- or 9-inch square pan. In medium bowl, stir quick bread mix, water, oil and eggs until well blended (batter may be slightly lumpy). Gently stir in 1/3 cup of the pineapple and 1/4 cup coconut. Spread in pan. Bake 8-inch pan 35 to 40 minutes, 9-inch pan 25 to 30 minutes, or until toothpick inserted in center comes out clean. Cool completely, about 1 hour. In small bowl, mix all glaze ingredients until smooth and spreadable. Spread glaze over coffee cake. Sprinkle with 2 tablespoons coconut. 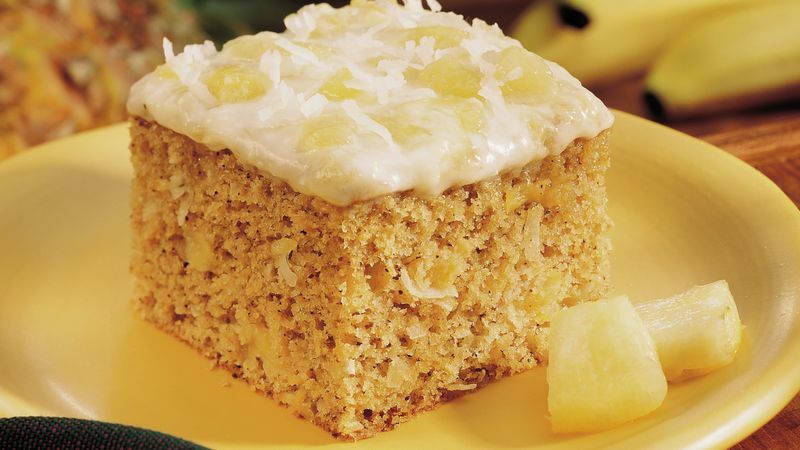 Keep coconut on hand to top this and other dessert treats. Seal any unused coconut in a food-storage plastic bag to retain moisture and refrigerate for maximum freshness. Drain the pineapple well before adding it to the batter; the juice is excellent in the glaze.